Due to a change of ownership of our premises the ELMRC is looking for new clubrooms. If you know of any suitable inexpensive property for rent in the Edinburgh area please contact the club. Founded in 1951 the Edinburgh and Lothians Miniature Railway Club is based in Piershill on the east side of the City of Edinburgh, Scotland. 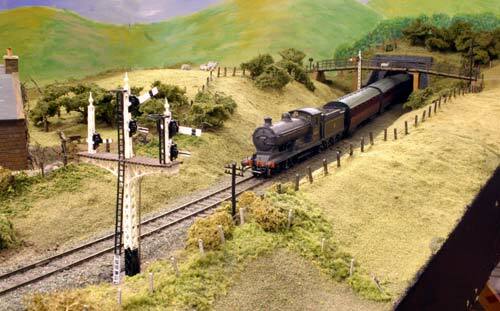 We have two '00' layouts and one '0' gauge layout as well as an 0:16.5 narrow gauge layout. For more information and pictures please explore our Club Layouts pages. Unfortunately we do not have space to assemble more than one layout so at any time a layout may be being used or being worked on or in storage. All the club's layouts can be made available for exhibition. We attend a number of exhibitions throughout the year, mainly in Scotland, though we have shown layouts further south. As well as the club's layouts some of our members have their own layouts which may be available for exhibitions if requested. If you would like to join us or want to see what we do the club is open on Tuesday and Thursday evenings between 7:30pm and 10:00pm. Details of how to contact and find us are on our Contact Us page.